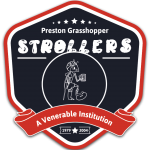 It began about 0300hrs when one of the Stroller’s colts came up to me and said “I think your friend’s dead.” To spare his blushes we won’t identify the individual beyond the fact that he was an ex Strollers Skipper. As this obviously called for medical assistance but none being available I rounded up Ennis and we headed back to the hotel to inspect the corpse. It was not a pleasant sight but we managed to stop him drowning in his sodden bed and get him into the shower bath for a good sluice down. We chucked in the sheets as well at which point Ennis remarked: “It’s all very well but I normally have a nurse to do this sort of thing for me.” As we continued with our task the resurrected corpse went back into the room and promptly fell asleep in the non-contaminated bed and failed to wake up on Dad Brierley’s return leaving him to sleep on the floor. Apart from him paying a large monetary fine the kitty stumped up for an adult incontinence nappy to be worn for the remainder of the tour.